Kevin began training for triathlon as a result of a severe foot injury. With surgeries, a very long recovery, and possibility of permanent disability in his future, Kevin was inspired by a single act of kindness from a neighbor and the story of a little boy and his family. He realized how quickly a single event could change someone's life forever. He knew he may heal when others can't. To help those families, while still unable to walk, Kevin registered for his first Ironman70.3 and over the course of 6 months, determined to recover and raise money for others, trained and successfully completed his goal. With several races under his belt now, Kevin's mission is to use the spirit and inspiration of competition to promote awareness to causes that support those who need it most. Kevin is forever grateful to those who helped along the way and he is committed to pay it forward. Some of you may know the name already. Andrew was competing in the Ironman 70.3 New Orleans in 2014. Two days before the race, during a short training ride, Andrew and his brother were struck by a car traveling at over 70 mph. His brother-in-law was fatally injured instantly and Andrew’s injuries included a broken back in 3 places as well as a broken foot and hip. As a result, Andrew was paralyzed from the waist down…but that hasn’t stopped him. I started running in 1997 and in 1998, my Aunt convinced me to enter my first race. I ran the Peachtree Road Race and felt awful. After finishing, I thought I’d never do that again. The next day I realized if I train a little I might be able to do something with it and enjoy it more. From 1998 to 2009 I had ran more than 30+ Marathons, over 30 ultra marathons and also some adventure races. My PRs were 2:57 marathon, 1:21 half, 36:56 10k and 17:11 5k. In 2009 I had a virus that attacked my heart. I had heart failure one minute, and woke up with a pacemaker the next. I thought my running career was over! After a while I started running a little and my fitness was coming back. A year into my return, I decided that I wanted to run a Ironman! I figured that I had never done one so if I could just finish it would be a PR! I went on to finish 2 full Ironman races and a few 1/2 Ironman events. In 2014 I was competing at the Ironman 70.3 New Orleans with my brother in-law. Two days before the race, we were hit by a car from behind traveling over 70 mph. My back was broken in 3 places, hip and foot also broken. It killed my brother in-law instantly. It took a few weeks to realize that I was paralyzed from the waist down and at that point I thought it was over for me. 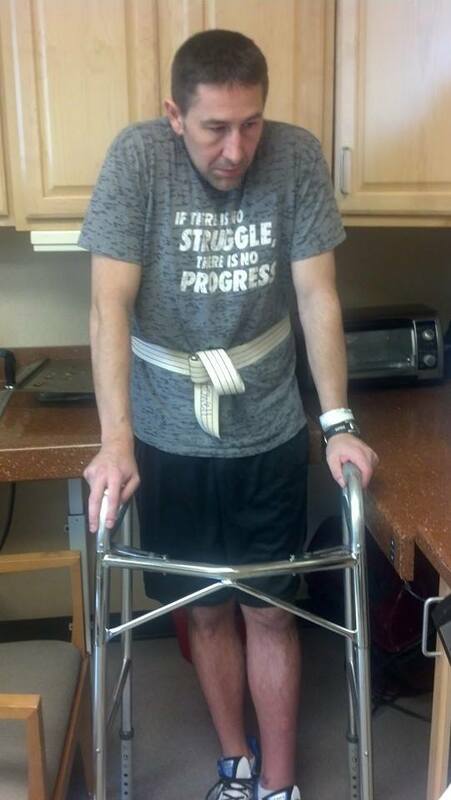 After months of PT and rehab I was blessed to be able to walk. Then I started trying to jog. This was a crash course. By 2015 I was able to go back and finish the Ironman 70.3 New Orleans that my brother-in-law and I were supposed to have done the year before. It hurt a lot and it did not feel anything like it did before but I was happy to do it for me, for him, for the family. I want to be able to give back. Sports has given me so much. I also know how hard it can be to over come struggles. I feel that I can help others that have had struggles like me and to let people know it is Ok. We just have to make sure that we don’t give up. From early adulthood my husband and I were fortunate to be able to assist others. Our philosophy was that we had our needs met, and were aware that others did not. We sought resources in which we could help. Whether it be fundraising, donating or contributing time. There is always a need somewhere, and we do what we can. Contributing to our community is essential and sustain a whole and happy community. Cathy has been employed with Allstate Insurance Company for 35 years, 20 years at corporate and 15 years in the sales arena, including six years with the Boling Agency as a licensed agent. Cathy has earned her professional license in Personal Property & Casualty, Business and Life and Health Insurance. Cathy works closely with Allstate customer as well as business partners throughout Gwinnett County and has built solid personal and professional relationships. Cathy is Past President of the BNI (Business Network International) Record Busters Chapter and an active member in the Gwinnett Chamber of Commerce. She has served in a number of leadership roles to benefit charitable organizations such as the Grayson Children’s Fund, the WES Foundation’s Ride to Survive and Mutt Strutt among others. Austin is a para-triathlete. 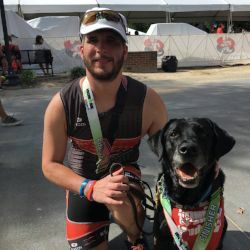 He discovered triathlon when meeting the person that raised his guide dog, Bently. Bently is a team member for sure; keeping up with Austin on those long training runs. Sports have been a part of Austin's life for quite a while. He currently works in sports television broadcasting and always wanted to participate in sports. He found a way with lots of hard work, determination, and encouragement. Austin set out to lose weight, train, and compete. The sport has given Austin a platform to tell his story and raise awareness for visually and mobility impaired athletes. His goal is to encourage others with impairments to become involved in sports . . . to push the boundaries of what they think may be impossible. Morgan entered her first Ironman with no triathlon experience while on bedrest following a pacemaker implant at age 24. The sport of triathlon has allowed her to prove to herself that while you may be down at times, only you can decide when you’re out. By choosing not to be held back by a medical diagnosis, triathlon has allowed Morgan to travel the world over to compete. She shares her love for the sport and her passion for working with special needs families. Morgan’s continued goal is to use her story and abilities to promote awareness, inspire, and help others to rise well beyond challenges and obstacles. To help you do your best, Michael can provide free sprint, Olympic, 70.3 and IM training plans for all 3TSports team members as an added benefit for supporting the team and our causes. Michael can also provide a personal training experience that will enable you to grow as an athlete while still focusing on the important relationships in your life.